Participating stores in the Sorachi Gate Area are prepared to provide helpful information and beneficial information to our guest cyclists. Economical coupons that can be used within the area can be found on each website. Some are offered for a limited time only, while others are good through the year, so be sure to check for the latest information. 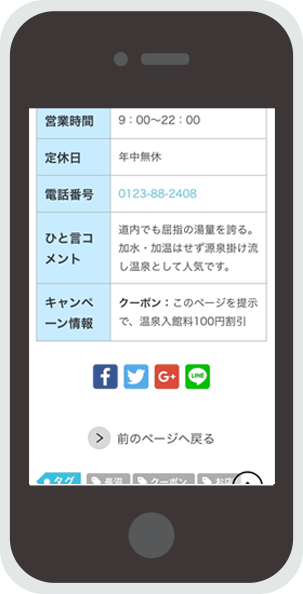 In order to use the coupons offered, simply bring up the screen with the participating store information on your smartphone or tablet, and show it to the staff. Be sure to check what is available before you head for the Sorachi Gate Area. 1. 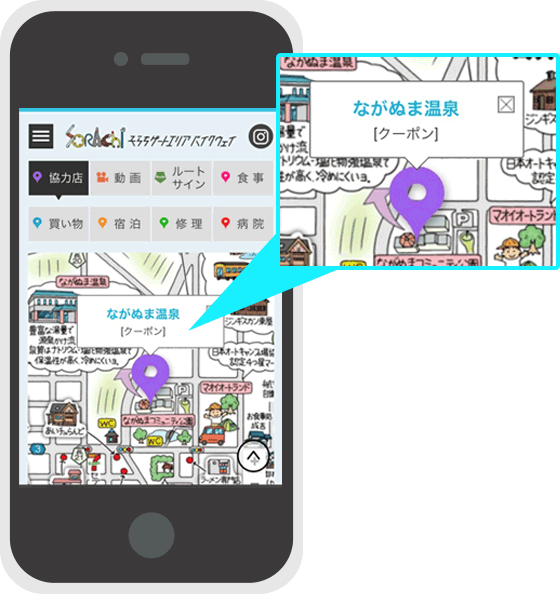 Tap the marker on the illustrated map, and the store name will appear. Participating stores with coupons, will be indicated with [coupon] mark. Tap on the store and the participating store page will appear. 2. Show the participating store's page to the shop staff.